If you can get through even part of the many imaginative graphics (many free) created in partnership with some of the finest artists on the web, without being inspired to create a new webpage -- you have more willpower than I do! 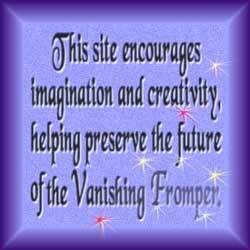 This warm and welcoming site originally grew out of a chat group, but its celebration of imagination attracted and inspired a growing circle, re-awakening Muses and birthing new ones. Agent Moody said in applying, "Thalia, I can't really say I've inspired people to create their own website, I can say that I've maybe inspired my friends to start writing again. Some of the people who have written for my site haven't done any kind of writing in years. I try to encourage as many people as I can that it doesn't have to be a masterpiece, just a piece of themselves. That is what gets the ball rolling." Indeed it does. Extensive resources to support and encourage writers and authors, from e-forums to e-publishing. Stephanie has built an extensive set of web-pages for Winnie the Pooh, which would endear her to Thalia's heart all by itself. By including original graphics, games and recipes they become not only creative, but inspire creativity in others. Graphic intensive, they should still load fast enough to keep up with your reading. You will have to have a lot of patience if you visit Stephanie's home page, but after visiting Pooh you may want to; it's fun. As a family member, friend, and counselor, she celebrates life and helps other people celebrate it too. Displaying historical landmarks of North Carolina's Outer Banks through original photography and text. Site creator Janice I. Magro teaches a 5th grade class that has been inspired by the website, and by receiving letters, flyers, stickers, and commemorative envelopes of the Currituck lighthouse from the Light House Keeper. Jonathan offers fiction, nonfiction, prose, poetry, short stories, novels, essays, humor, and satire; imaginative fun in a fantasy roleplaying game called "The Minstrel's Song"; plus creative and useful etcetera. While researching Artificial Intelligence, Benji Adams has started a forum where you can create your own A.I. identity and turn it loose among others to chat and play.